Sometimes I give guided tours at the museum for exclusive people like the wives of ministers and presidents. It’s the museum director who takes care of the fun celebrities from Hollywood. Once P. from the bookstore saw a guy with a cap flashing by the bookstore going to the director’s office. When you see a cap and somebody speeding at the museum, it’s probably a celebrity. 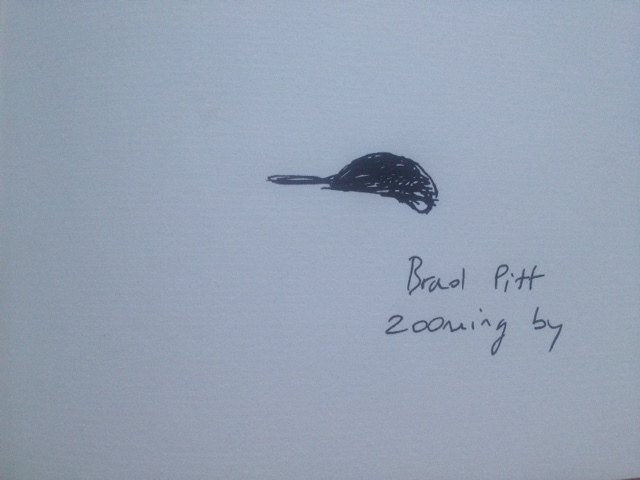 Later P. heard that it was Brad Pitt zooming by. On the TV-screen in the subway on my way home I read that Pitt had been wearing different hats throughout his Berlin trip to misguide the press. Hollywood stars are smarter than the government people, whose arrival at the museum is always so obvious that they seem to be screaming for attention - probably because they know nobody really cares. First the undercover men arrive, dressed as undercover men with the main purpose to create a nervous atmosphere. A little later a line-up of police cars arrives in front of the museum announcing the arrival of the car with the president’s wife, which then arrives a few minutes later. She is mostly accompanied by an entourage of embassy and security people, wearing black sun glasses and grey suits. I like it when reality tries to be a movie. I always try to adapt as a guide and act like I'm a movie star too.